Build-A-Bash 2018 Fundraising Campaign for Habitat for Humanity of Schenectady County, Inc.
A Special Event Raising Funds for Habitat for Humanity of Schenectady County, Inc. The Build-A-Bash will celebrate it’s 6th anniversary on Thursday, September 27th at the Schenectady Armory for an incredible evening of fun and thrills. The screams, shouts and applause will boom throughout the Armory as our contestants fiercely compete in the infamous Tug of War Challenge. You can watch or join in the Hammerschlagen contests, going shoulder to shoulder with other competitors. This one-of-a kind evening begins at 6pm. Jack Aernecke will be the Master of Ceremonies.The Major Food & Beverage Sponsor is Mallozzi's, you will enjoy delectable cuisine with a cash bar. There will be entertainment by the Electric City Chorus and the Immortals Band to dance the night away when the competing is over. New in 2018, a scream raising extreme experience from the rafters by Mountain Ridge Adventure. With your feet on the ground you can play Wild Sports Stackers XL Game, enjoy the colorful balloon sculptures by Mr. Twisty, grab a late night Newest hot dog before you leave and much more! Making this evening more special is the celebration of Schenectady Habitat's 25 years of opening the door to affordable housing, with 25 artists displaying their work throughout the Armory. Habitat ReStore donated 25 doors to be transformed into works of art. This imaginative project will be displayed around Schenectady in the weeks before BASH. Door will be auctioned at Build-A-Bash throughout the evening. 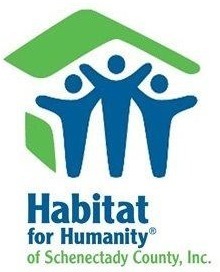 Habitat partnered with C.R.E.A.T.E. Community Studios for this 25th Anniversary Project. Come join us and Play it Forward as we raise funds for our mission of providing affordable housing for hard-working families in Schenectady County. Entry into the event AFTER 8:00pm to dance to the Immortals Band, while enjoying a Newest Hot Dog. Entry into the Bash, including many culinary delights by Mallozzi's, a cash bar, a LEAP from the Rafters by Mountain Ridge Adventures, Hammerschlagen, cheer the Tug Teams onto victory, live entertainment and MORE!